One of my favorite spaces to decorate is a 4 season room. They are gorgeous spaces that always offer tons of light, the beauty of the outdoors, and tend to encourage much more design creativity than other areas of the home. 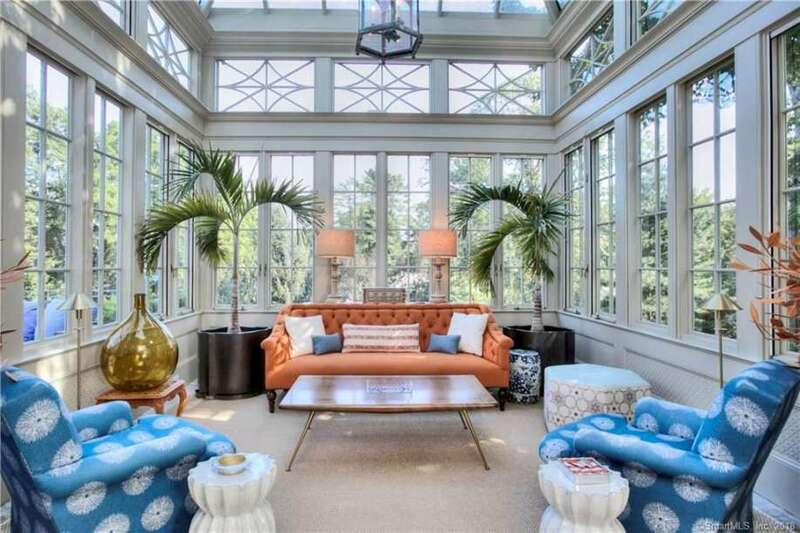 I absolutely love this sunroom design because it incorporates beautiful floor to ceiling windows, a fun color palette and funky accent pieces. It is a great example of how you can elevate the look of the 4 season room to be quite a striking space. Whether you are searching for ways to decorate patio enclosures or need suggestions for how to update a traditional sunroom, you can take inspiration from this design. The color palette should always complement the beauty of nature outside the windows. A beautiful sunroom design can instantly add value to your home. I personally love these rooms because they give you a quiet area away from the more high traffic main living spaces. They allow you to take in the beauty of the outdoors in a temperature and weather controlled setting. Most sunroom ideas feature beautiful floor to ceiling windows, a neutral color palette with pops of organic shades such as blues and greens, and comfortable furniture to lounge or dine. Another great feature to include is a wood burning fireplace. This adds an element of coziness and can also be a source of warmth in the winter if you decided not to add centeral heating or air to the room. When you are deciding on the right sunroom decor for your space, there are a few things you should remember. 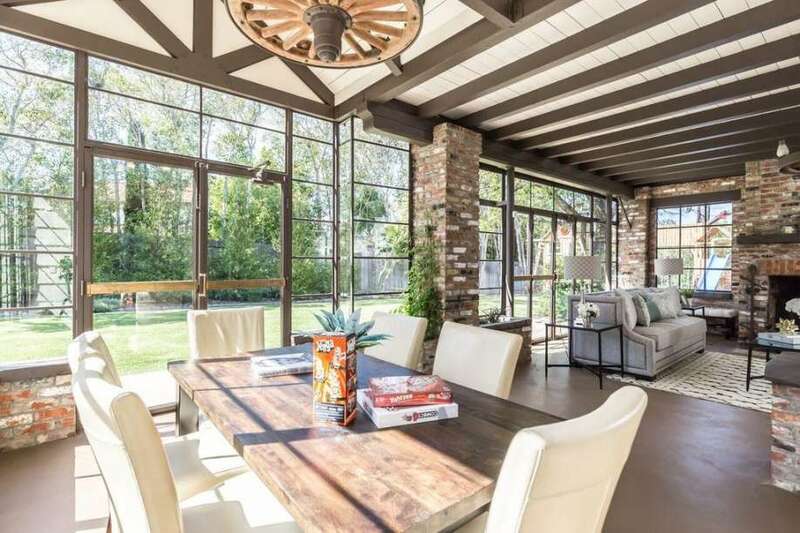 One of the latest trends in home remodeling for 2019 is the idea of the sunroom extension. The difference between your more traditional sunroom that features floor to ceiling windows and has a typical door way, is that an extension has a glass ceiling. They offer a way to add on to an existing sunroom or to create a small bump-out from an exterior room. I actually find them to be much more beautiful because of the gorgeous light that shines in from above. If you don’t want to commit to a full sunroom extension, this large bay window design is a nice alternative. It incorporates the beauty of the outdoors with the comforts of an interior room. 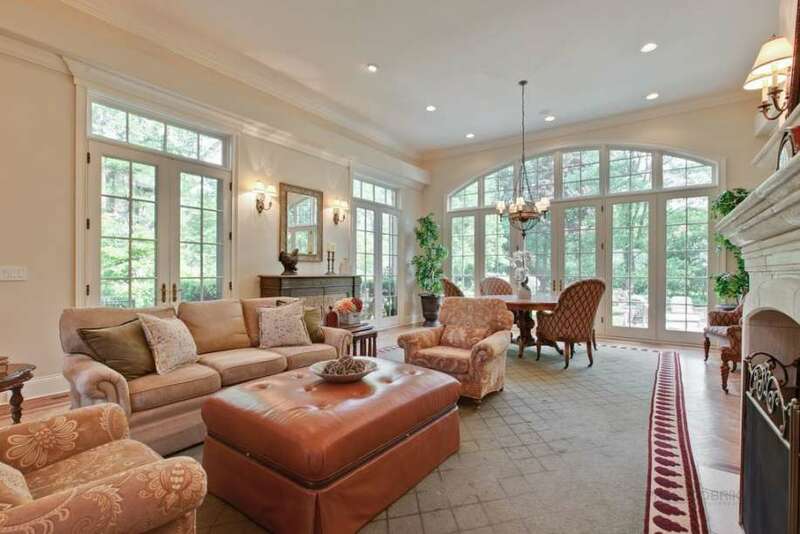 If you are looking for some great sunroom ideas, this home is your inspiration. The designer hit it out of the park with layout, finishes and overall decor scheme. The first thing I was drawn to was the unique look of the sunroom windows. The interesting panels have an industrial feel and make you feel like you are in a cool downtown loft rather than a suburban backyard. This paired with the exposed brick, whitewashed wood panelled ceiling, and rustic beams create a really unexpected mesh of design schemes. The sunroom furniture they selected was another unique choice. The foundation of the room is quite rustic and masculine, whereas the furniture has a distinctly softer and more delicate feel. 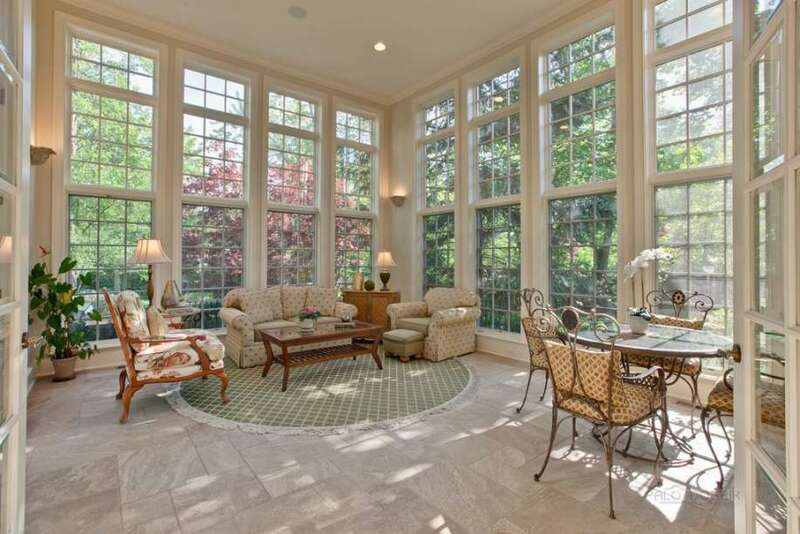 Four seasons sunrooms are an essential element of any southern home. In our climate of muggy summers, crisp falls and very mild winters, we are able to use our outdoor spaces longer than homeowners in other areas of the country. For this reason, a sunroom addition is a great option for any home because they allow you to enjoy the weather in an enclosed area. This stunning two story space is the perfect example of how to incorporate these rooms alongside the rest of your home. Placed just outside the kitchen, it is easy access to the rest of the living areas and provides a lovely area for dining and lounging. The floor to ceiling windows framed by beautiful trimwork, provides most of the decor in the room. 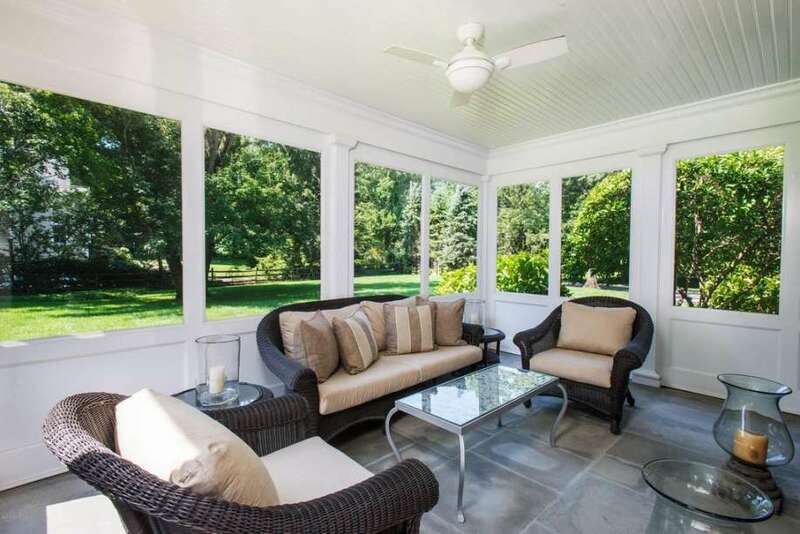 A screened in porch is a must have in any home in a warm climate like where we live. The weather remains beautiful most of the year, but bugs and sunshine often prevent my family and I from wanting to venture outside to enjoy it. That is why we decided to install a new screen room. Our goal with this renovation was to create a space that we could spend time together away from the television, but that we could utilize rain or shine. We love how it turned out. As we designed the new space, I peferred the look of sunroom ideas because they tended to create the appearance and functionality of a more interior space. I did not like how rustic some screened porch ideas were.